A couple days ago, I was making the trek through all of my old emails to try and clean house a bit. I start to get a bit crazy when my inbox fills with old messages. It’s sorta like getting those coupon mailers in my physical mailbox at home. I leave them in there until I just can’t handle it anymore. — Or until the postman leaves me a mean hand-written message to remove them all… #truestory. When I was browsing, I noticed a trend. A lot of users wanted to know if I had any secrets to the perfect Southern biscuit. As everyone knows, you ain’t Southern unless your family has a biscuit recipe on a tiny index card floating around the house. Biscuits really aren’t difficult at all. 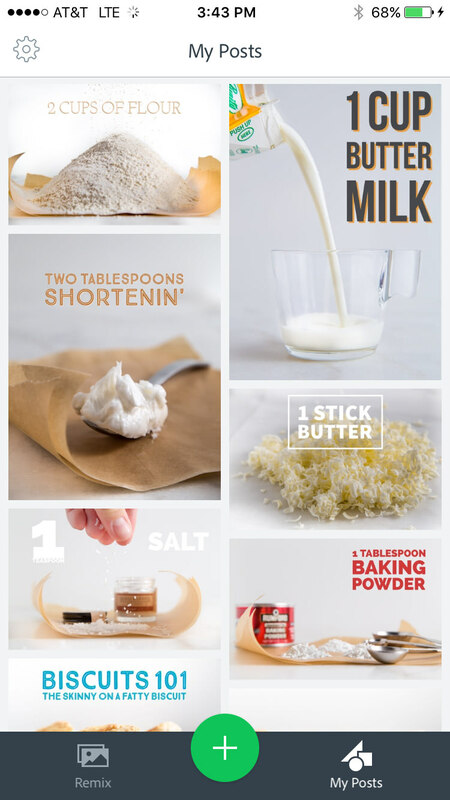 I’m sharing with y’all my favorite, incredibly easy recipe step-by-step with help from the free Adobe Spark Post app to create the best guide photos. Southern biscuits are a thing of beauty. I think most people assume they are complicated and not worth the trouble, when they can just buy a can from the grocery and pop them in the oven. Listen here. You will not ever get a biscuit as amazing as these from anywhere other than your own little hands. The same hands that smack that can-o-‘cuits against the counter can make them a million times better in minutes. Also– Is anyone else absolutely terrified of those biscuit cans as I am? Honestly. It’s like a ticking time bomb. You never know when it will explode into a weird spiral monster thing. Confessions of a Scared Fatty — I’d rather throw it across the room than be close enough to press on the seals myself. Just make some real ones already. The type of flour you use is important here. After all, biscuits have very few ingredients. Making sure they are all of great quality will ensure your biscuits are also great. I was raised to believe that White Lily AP flour was the only type of flour that should ever touch a biscuit. I can’t say that I follow that all of the time, and maybe it’s totally in my head, but it does seem to make for a mean jam boat. Super soft, fluffy. Whatever type you use, make sure it is all-purpose for this recipe. Some will use self-rising. I prefer to control the salt and leaveners (soda, powder) myself. 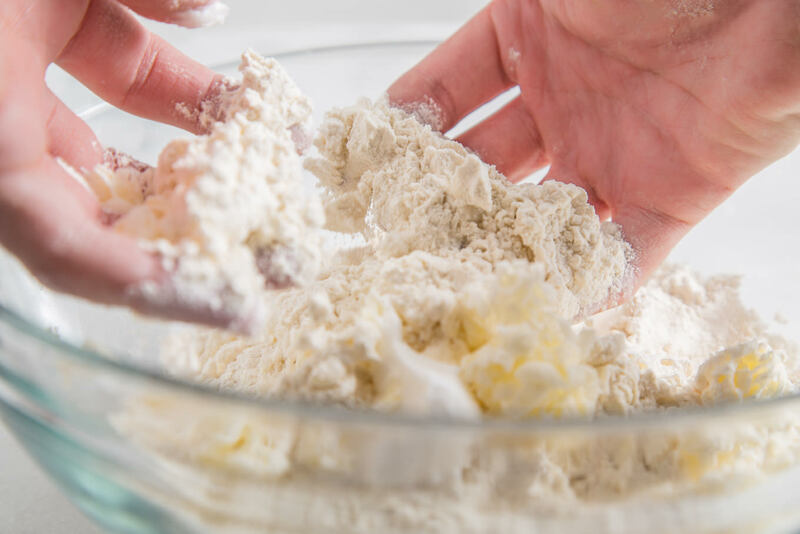 If you don’t feel like sifting your flour, just whisk it well. It basically does the same thang. That’s a trick that I incorporate all the time. Who wants to clean the sifter, anyway? 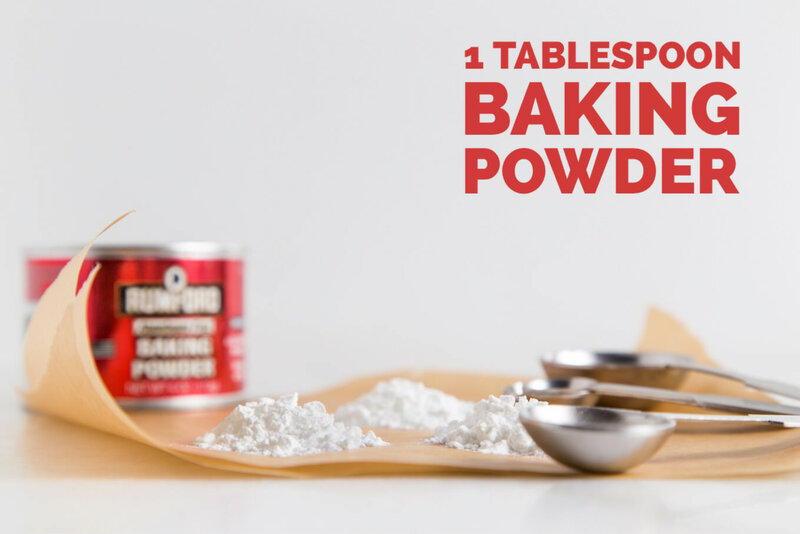 You are going to want to make sure you mix the salt and baking powder well into the dry flour. Don’t wait until it’s a wet dough to do this. Toss it in the bowl and whisk away. 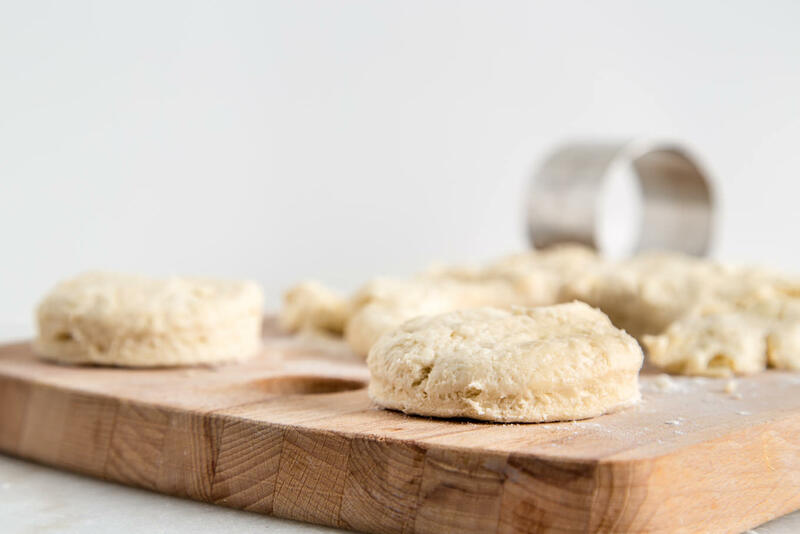 Doing this while dry will prevent the biscuits from being tough and flat and boring. Nobody wants a boring biscuit. Nobody. Something else to note– This is a super easy detail to skip. Make sure your leavening ingredients are fresh. I mean Fresh Prince, fresh. I always write the date I open the powder on the lid when I start a new tin. 6 months is about as long as I’ll let it go opened. The reason is that is collects moisture and starts to lose its kick. You can toss a pinch in some warm water to see if it’s still perky. It should bubble like the Prosecco that I’m currently holding while waiting for another biscuit batch to finish. Boozy baking, anyone? Here is another great example of why great ingredients are so important. I’m pretty sure there is a fancy Julia quote about this point, but I’ve had another glass now and can’t remember. You get my point. Buy the best butter you can afford to get. I almost solely use a higher fat, European-style butter for anything I am baking. Especially something that contains butter as the main ingredient, like biscuits. 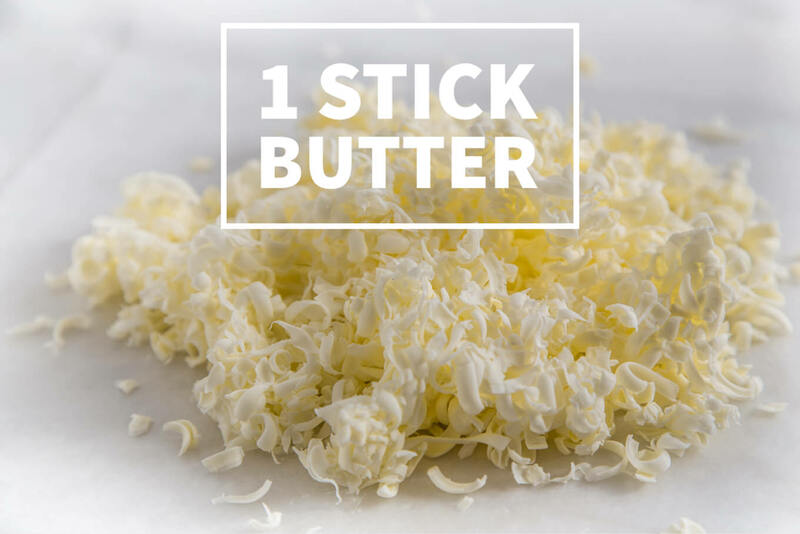 Look for something with more than the typical 80% butterfat of American stick butter. It’s worth the effort. I promise. You’ll see that the butter that I use for biscuits looks… different. I’ve grated it. Keep sticks in the freezer and run them through the ol’ food processor or hand-grater. Put it back in the freezer. You want everything to be caaaa caaaa caaaaa-oooold as ice. You can even keep some flour in the freezer if you are super-serious about it all. Keeping the ingredients chilled keeps those biscuits flaky and cloud-like. You could chop or cut the butter in, but this post isn’t called half-assed biscuits. It’s about the best biscuits! 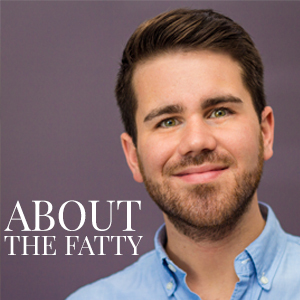 Because, well… this is Southern Fatty. I may lose some of you on this one, but trust me just this one time. Shortening in biscuits, just a bit, is a trade secret that I use to help with the layering and fluffiness of the golden biscuits. Since shortening melts at a higher temperature than butter, I’ve found that it really helps to create those internal scaffolds to puff and seal in the goodness. You can skip it if you must. Yes. I will never speak to you again if you do, but whatever. Try it once for me. You’ll never turn back. 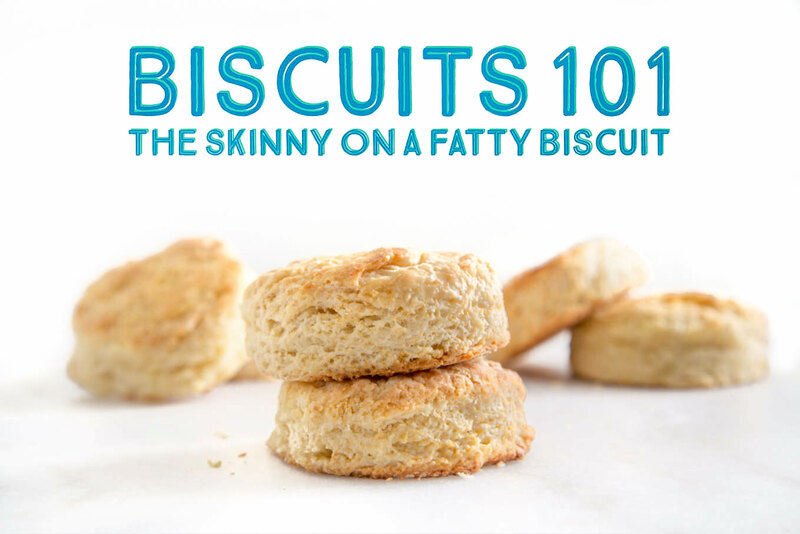 It’s just a pinch, and biscuits aren’t supposed to be diet food. AMIRIGHT? You can also fold the dough over itself when you mix. I find that this does help with height, but can also toughen it a bit. Milk, milk, buttermilk. — Buttermilk is such an underused ingredient in kitchens these days. Some don’t want to have to buy something that they don’t think they will ever use for anything else. I think at this point, I could replace my regular ol’ cow juice for this much more sophisticated cousin. You know… the one that brings wine to the party instead of another PBR and Funyuns. Buttermilk has a richness that can’t be beat by any of the other competitors. The slight tanginess perfectly cuts the butterfat of the biscuit, while providing an incredible amount of moisture. 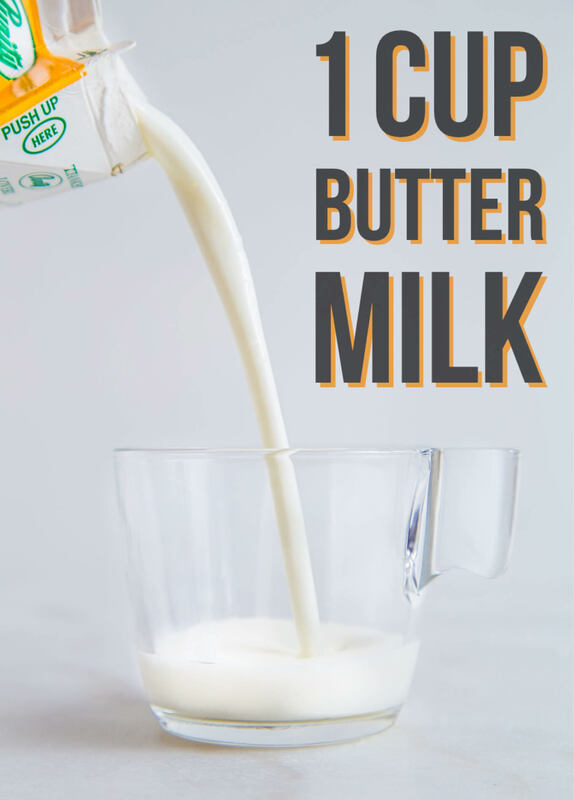 If you don’t have or want to buy buttermilk, toss a spoonful of lemon juice into whole milk. Wait 5 minutes and you have a poor man’s buttamilk. Can we also take a moment to oogle at those cute image graphics for a sec? You may have read my Instagram 101 Tips post recently that I created with the help of Adobe Spark Post (previously Adobe Post). Adobe is one of those brands that I quite literally use every single day of my life. I edit photos for the blog, for my food photography business, for my Instagram. The list is endless. They are such a well-respected and known brand, that I put full trust in my brand to their software. Recently, they released a new FREE app, Adobe Spark Post. I used the app (on my iPhone — also available online for desktop) to upload the photos that I took for the post; it selected a theme based on the colors it found in the images (seriously! ), gave me options for adding text or filters and edits, and I saved the final results to upload here for y’alls pretty eyes to see. Honestly the simplest process to create great, elegant-looking boosted images. I can’t say enough positive things about this app. I’m thrilled to share it with everyone. — Go download and try it out for yourself. FOR FREE. You’d think this step would be the most simple of them all. While it is pretty easy, it’s critical to get it right. One of the huge biscuit-makin’ mistakes that people make is mixing their dough too much. You want to toss it around and just moisten everything. Don’t knead. Don’t stir. Just wash those hands and get in there. Flop it around just until it’s come together. 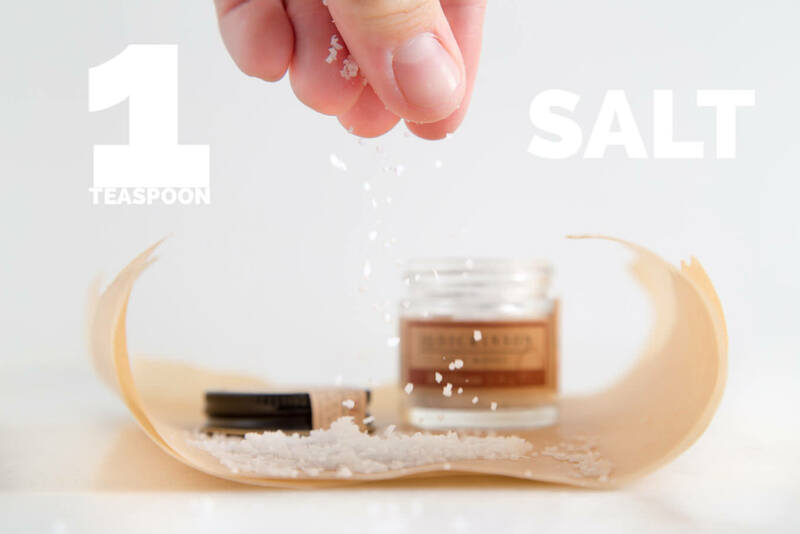 This creates those perfectly light layers and keeps the biscuits soft. I often just mix in the same dish that I use to press them out. That’s one less time you have to move the dough around. It’s that sensitive of an issue. Punch ’em out. Brush it off. When you cut your biscuits, you want to be gentle with some force. Sorta like training your cats to stop running across your laptop while writing posts (UGH). Be gentle… but firm. I don’t usually use a branded biscuit cutter. I have several ring molds around my kitchen that I use for mostly desserts and other baking. They are solid steel and work perfectly. No top on them, so there is no suction to prevent the cuts from falling back out. A 2 3/4″ ring is my choice. You can use a glass, like I used to see done in my childhood, but I don’t think it cuts sharply enough. You want a clean cut. Straight down with it. Once you have the biscuits punched out, you can brush them with a bit of the leftover buttermilk. You don’t have to, but I think it helps to give them a beautiful top color. Butter would also work. If you’re feelin’ fancy, sprinkle a bit of coarse salt on the tops. There you have it! Baked to perfection. Biscuits are the perfect tabletop bite. You can eat them how they are, on the go, put jam on ’em, layers some country ham or prosciutto between them, toss some fruit (blood orange, anyone?) or other additions (sage and vanilla?!) in. The possibilities are really endless. Punch a notch on your Southerner card. 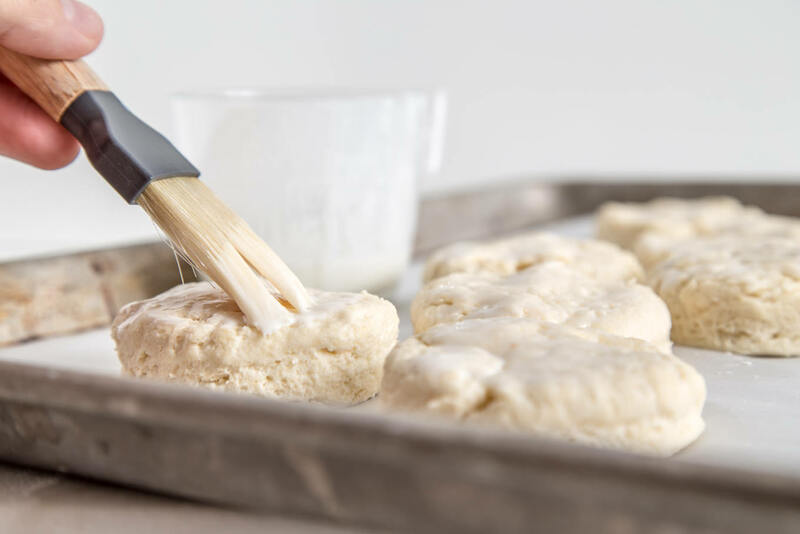 You now know how to make the best biscuits. 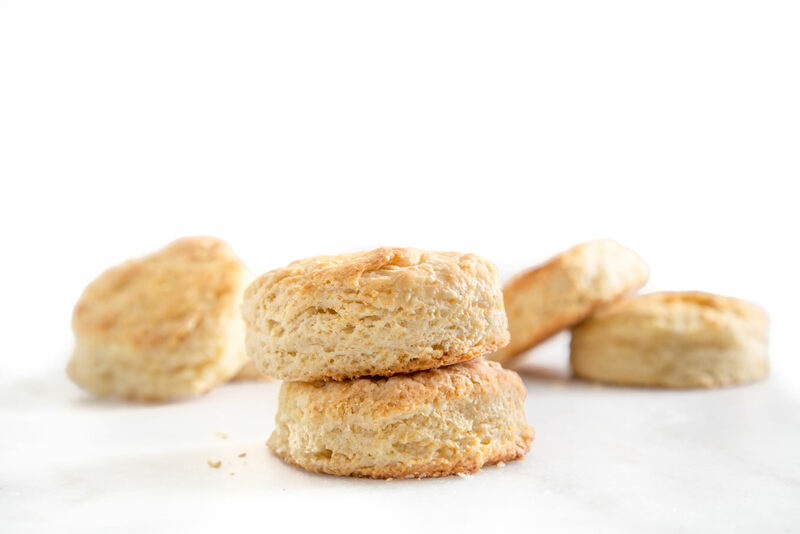 Classic Southern-style recipe with tips for perfectly fluffy, golden biscuits. From SouthernFATTY.com. Grate frozen butter and return to the fridge/freezer with shortening until ready to incorporate. 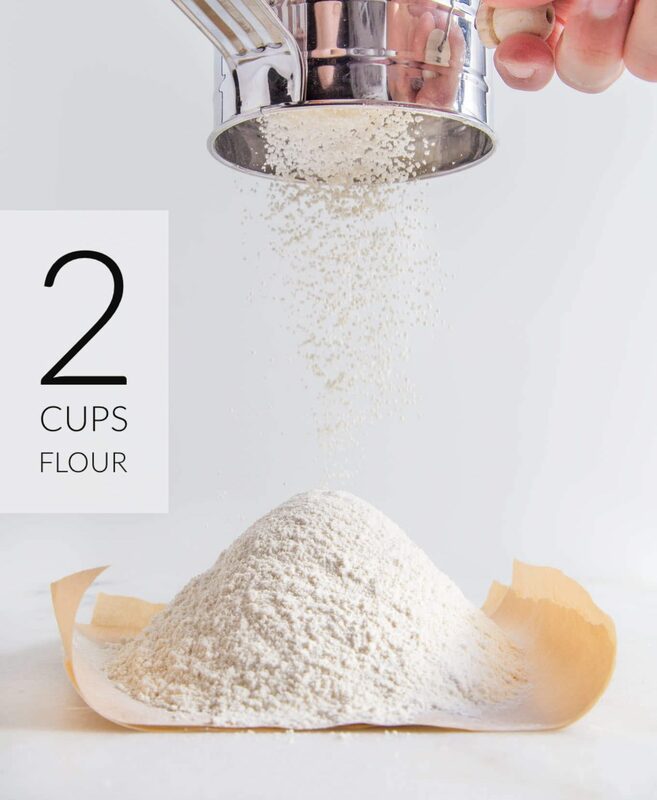 Combine flour, salt, baking powder and sift or whisk into a large bowl. Add butter to flour mixture. Add shortening. Carefully, quickly mix to combine. Best to mix with fork or pastry cutter so it doesn't warm. Add a pinch of baking powder to the buttermilk and then add to mix, starting with about ¾ of the cup, adding more if needed. The dough should be very loose. Reserve the remaining buttermilk to brush tops. Use your hands to quickly fold dough together. Use a folding action instead of a stirring. You want to work the dough as little as possible. Flatten carefully to little over an inch thickness. Pressingly firmly straight down, cut out biscuits. I use a 2¾" ring mold cutter. Carefully transfer biscuits to a pan or sheet lined for baking. Place biscuits so they are touching each other on the sides. Optionally, brush tops with buttermilk. Sprinkle with a bit of finishing salt, if you'd like. Bake until golden, brush with butter, fill with jam and enjoy! Click here to download the free Adobe Spark Post app to create graphics like these. Disclosure: This post was made in partnership with Adobe. I truly enjoy their brand and products, and am thrilled with be promoting based upon my own opinions. I’m gonna have to try these. I love baking – cakes, pies (crust made from scratch thank-you-very-much), cupcakes, cookies whatever – but biscuits defeat me. My guess is somehow they know that I’m not BORN Southern and they’re holding that against me. Or perhaps….I just never learned the right way – I’ll give it a try and let you know. I agree that they may just know… Hope they work out! So I’m confused. 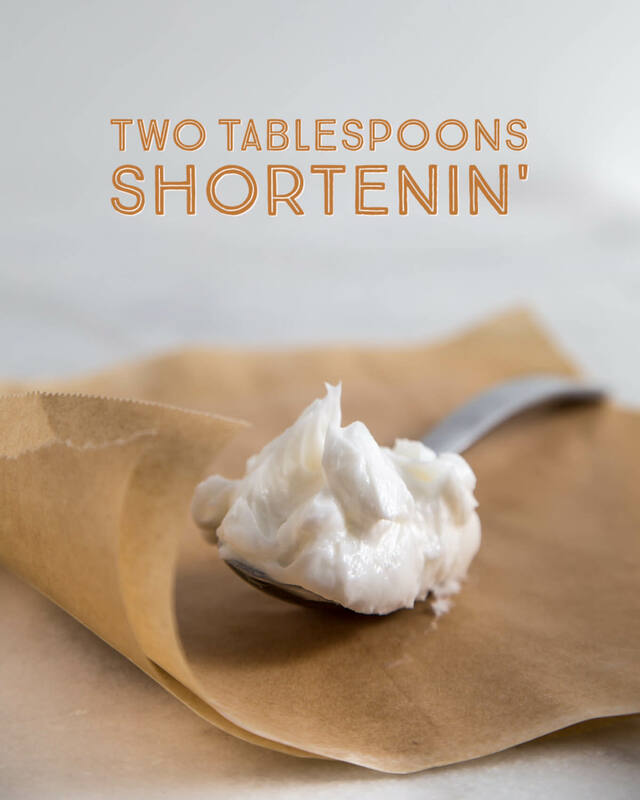 Up in the first part of the post, you talk about using 1 stick of butter and 2 Tbsp of shortening. In the text description, you way 6 Tbsp butter and 1 Tbsp shortening. Which is it? Oops! You’re right. I must have made the images while still testing. Go for the recipe list. Unsalted. Or cut back the salt in the recipe if using salted. Biscuits are the best ever!